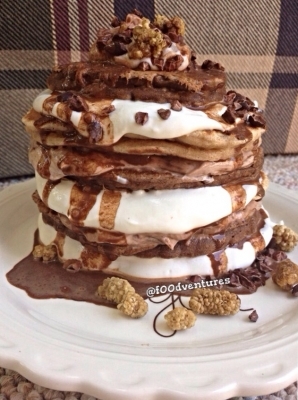 Delicious vanilla and chocolate pancakes layered with a graham cracker protein filling and a chocolate protein filling then topped with cacao nibs and a chocolate sauce. I don't think it gets any better than this. Combine ingredients and mix well. Evenly divide the batter between 2 bowls. In one bowl, add 1/2 scoop vanilla protein powder of choice. In the other bowl, add 1/2 scoop chocolate protein of choice. Cook your pancakes and set aside to cool while you prepare your filling. Spoon your filling Inbetween your pancakes. Top with cacao nibs and chocolate sauce (chocolate protein powder + baking cocoa + water).